Our firm's reputation for providing quality service reflects the high standards we demand of ourselves. Our high standards, responsive service and specialized staff spell the difference between our firm and the rest. Learn more about our Firm, our Employment Opportunities, or Meet Our Staff and learn about the role of the Enrolled Agent. 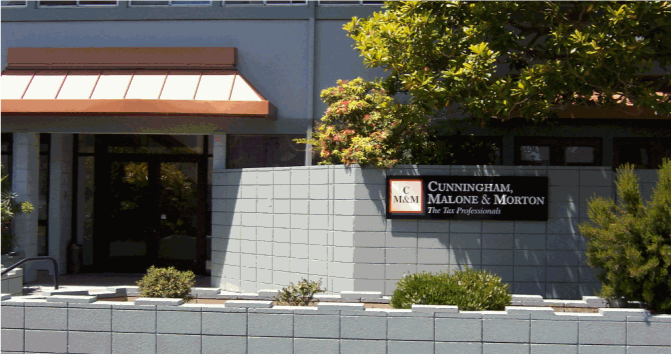 Cunningham, Malone & Morton was formed in 1994 through the merger of the individual practices of Michael Cunningham, EA, Ronald Malone, EA, Emeritus, and John Morton, EA, Emeritus, bringing together over 75 years of combined business experience to our local community. CURRENT EMPLOYMENT OPPORTUNITIES: TAX PREPARER: Cunningham, Malone & Morton welcomes resumes for seasonal, qualified licensed tax preparers. Salary dependent upon qualifications and experience. Cunningham, Malone & Morton was formed in 1994 through the merger of the individual practices of Michael Cunningham, EA, Ronald Malone, EA, Emeritus, and John Morton, EA, Emeritus, bringing together over 75 years of combined business experience to our local community. In 2008, John "Jack" Morton retired and, along with The Malones, sold their interests to our newest colleague, Keith N. Crossley, Certified Public Accountant. The Malones moved to Rohnert Park in 2010 where they continued to provide services to their valued clients and the office staff at C M & M, remotely from their home. They retired in 2014. Our firm provides outstanding service to our clients because of our dedication to the three underlying principles of professionalism, responsiveness and quality. Our firm is known for the quality of its service. Our firm's reputation reflects the high standards we demand of ourselves. TAX PREPARER: Cunningham, Malone & Morton welcomes resumes for seasonal, qualified licensed tax preparers. Salary dependent upon qualifications and experience. All interested applicants must submit a resume and complete an Employment Application. (Important: Print a copy of the application to your computer before completing). Mail the completed application and resume to our office, Attention: Mike Cunningham, or email to mike@cmmtax.com. You may fax it to (707) 444-0210. It is acceptable to bring your resume and application to our office, but please do not call or drop in to talk. We will call for appointments after reviiewing all submissions for each position. Prior to your commencement of work, we will check all references, and complete a background investigation. An enrolled agent (EA) is a federally licensed tax practitioner who has technical expertise in the field of taxation and is empowered by the U.S Department of the Treasury to represent taxpayers for audits, collections and appeals before all administrative levels of the Internal Revenue Service. Only enrolled agents demonstrate their competence in matters of taxation and report their hours of continuing professional education to IRS. Enrolled agents are the only taxpayer representatives who receive their right to practice directly from the U.S. government (certified public accountants and attorneys are licensed by states and their licenses are state specific). Unlike attorneys and certified public accountants, who may or may not choose to focus on taxes, all enrolled agents specialize in taxation. Enrolled agents advise, represent and prepare tax returns for individuals, partnerships, corporations, estates, trusts and any other entity with tax-reporting requirements. Enrolled agents prepare millions of tax returns each year. Enrolled agents expertise in the continually changing field of taxation enables them to effectively represent taxpayers audited by IRS. In addition to the stringent testing and application process, IRS requires enrolled agents to complete 72 hours of continuing professional education every three years to maintain their licenses. NAEA members are obligated to complete 90 hours in each three year period. Yes, Enrolled agents are required to abide by the provisions of the Treasury Departments Circular 230 which provides the regulations governing the practice of enrolled agents before the IRS. NAEA members are also bound by a code of ethics and rules of professional conduct.